In environmental sciences, all the pollutants of interest can readily be classified as organic or inorganic. These ones are of greater concern because they occur more often than any other ones we may think of. Inorganic pollution arises from mining and smelting of metals, fossil fuel combustion and chemical production coupled with widespread applications in engineering, electronics, industrial and agricultural practices. These activities have led to the presence of heavy metals and other trace inorganic chemicals in the atmosphere, rainfall, rivers, groundwater, soil, sediments and the biota. Organic pollution was first manifested following the growth in the use of pesticides in the years immediately after the Second World War and through the 1950s. The first organochlorine pesticides were DDT, Lindane and Dieldrin. Spectrophotometry (ICP-MS) and Energy Dispersive X-Ray Fluorescence (EDXRF) to mention a few. Chromatography is the dominant analytical technique for the identification and quantification of organic pollutants. Various, instrumental techniques are used by chemists and other environmental scientists for the purpose of detecting and determining the levels of heavy metals in a given environmental samples. For the sake of brevity, only two of the techniques (AAS and NAA) are discussed here. Atomic Absorption Spectrometry is a technique that includes the aspiration of the sample solution into a flame or an electrothermal device whose elevated temperature transfers tic of the electronic transitions of atoms of a particular element is passed the analyte ions into atoms in the vapour state. When an electromagnetic radiation character is through an atomic vapour of that element, the radiation at indeed frequencies is attenuated. The absorbed radiation excites electrons from the ground state to various higher energy levels (excited states). The degree of absorption is a quantitative compute of the concentration of ground-state atoms in the vapour. AAS is the most extensively utilized methods for the quantitative determination of metals at trace levels (0.1 to 100ppm) in a broad range of materials; its relative precision is 0.5 to 2percent. The main disadvantages include: (i) examples must be in solution or at least volatile; (ii) individual source lamps are needed for each component; (iii) the method isn't capable of simultaneous multi-elemental determination; and (iv)it isn't appropriate for qualitative analysis. Several of the diverse modifications of AAS are Flame Atomic Absorption Spectroscopy (FAAS) and Graphite Furnace Atomic Absorption spectroscopy (GFAAS). FAAS consists of a sharp-line radiation source, created by a hollow- cathode lamp, characteristic of the component of interest, a solution nebulizer and burner, a monochromator, photomultiplier and recording system. Even though FAAS is easy to activate and cheap, the burner- nebulizer system is comparatively an inefficient sampling device. Only a small fraction of the example reaches the flame and the atomized example passes rapidly through the light path thereby leading to a low detection limits, generally at the sub ∝ g/g or ∝ g/mL levels. Its dynamic range is as well bounded. One major instrumental dissimilarity between GFAAS and FAAS is that, graphite tube furnace (about 5 cm x 3 mm) is utilized in GFAAS in place of flame in the FAAS for the reason of vaporization and atomization. The graphite tube furnace is flushed through by an inert gas, for example argon, before vaporizing the model so as to stop the formation of refractory oxides and oxidation of the graphite tube. The axis of the furnace is aligned along the optical path of the radiation from the lamp. The sample (5 to 50 ∝ L) is deposited on the platform at the bottom inner surface of the tube near the centre to develop maximum sensitivity. The temperature is speedily elevated to about 2500 K by the passage of a heavy current for a period of 1 to 2 minutes. The heating cycle is managed so as to permit solvents to evaporate or organic residues to be ashed before an atomic vapour of the metal under investigation is generated. GFAAS has moderately low detection limits capability that makes it chiefly suited to the requirements of analyses of trace elements at low concentrations in a matrix. The main drawbacks of GFAAS are: (i) it isn't multi-elemental; (ii) it has bounded practical sample throughout; and (iii) the occurrence of high electrolyte species these as Na and Cl consequences in abundant non-specific absorption interferences. NAA is a non-destructive tool for routine trace element determination in many areas of innovative research. Apart from being able to determine many environmentally crucial trace elements such as Sb, Cd, Cr, Cu, Se, Ni, Zn, etc. NAA is also capable of determining major elements such as Na, Cl, and K as well as rare earth elements. The determination of the elemental concentrations is based on the measurement of induced radioactivity through the activation of the elements by neutrons. The radioactive decay of each element emits a characteristics X-ray spectrum. Hence, an individual nuclear "fingerprint" can be measured and quantified. The neutron sources used in NAA can be produced by a neutron reactor, a particle accelerator or artificial isotopes such as phitonium, and beryllium. The most common source is from a fission reactor due to its high neutron flux. NAA is an extremely sensitive, selective and precise technique that provides both qualitative and quantitative information at ultra trace levels. Such traits derive from a blend of features: (i) Extremely sensitive instrumentation by a facility for spectrometric distinction between radionuclide is available; (ii) activation cross sections can be large and interise neutron fluxes are available; (iii) the reagent blank problem that is so common in trace element analysis is largely eliminated; (iv) when sample processing prior to measurement is needed, the problem of working through ∝ g amounts of materials can be simplified via the addition of non-active "carrier' which doesn't influence the last activity measurement; and (v) extremely tiny example size (flakes of paint, single hair strand, and so on) can be analysed and identified via NAA. Several of the disadvantages of NAA are; (i) liquid samples can't be activated in a standard thermal neutron nuclear reactor; (ii) practical multi-elemental analysis is restricted due to the wide spectrum of short and long-lived nuclides; (iii) for short-lived nuclides measurement, the occurrence of main electrolyte species (Na, Cl, P, Br) on irradiation produces high background x-ray activities; (iv) the determination of many significant components as Be, B, Pb, P and Si is difficult due to poor nuclear cross-sections not activated via neutrons or, as in the case of P, not yielding a X-ray for analysis; and (v) it is an luxurious and extremely specialized instrumentation. Activity: Read about and prepare 'contact period' or term papers on EDXRF and ICP-MS. In ecological chemistry, chromatography is the dominating technique with respect to organic matrix analysis. Chromatography is an instrumental analytical technique that combines separation and identification of components of a complex mixture into individual entities. The chromatographic methods have good speed, high resolution power and tendency to handle small amounts of material. Every chromatographic system consists of moving or mobile phase in intimate interface through attached or stationary phase. The latter is composed of the stationary or all non-moving portion of chromatographic column or bed. An example component undergoes an balance distribution between such 2 phases. This equilibrium in turn decides the velocity with which each component migrates on column. The band-broadening and dispersion of each component in the direction of migration also occurs. Therefore differential migration and band-broadening decide the extent of separation of the sample. (i) Adsorption chromatography: This technique is depends on exploitation of the difference in adsorptivity of solute to the stationary support that is usually packed in a column for example various fatty acids can be separated via adsorption chromatography. (ii) Partition chromatography: includes chromatographic techniques such as liquid-liquid chromatography (LLC), paper chromatography (PC) thin-layer chromatography (TLC), gas- liquid chromatography (GLC) and reversed - phase chromatography (RPC). Here, we explore the difference in the partition coefficient or distribution ratio of individual species in the mobile and stationary phase. Some partition chromatography techniques like PC and TLC use plates while others use columns. (iii) Ion exchange chromatography: This procedure is depends on differences in the exchange potential between diverse ion exchange resins packed in a column. Examples are CEC, AEC, IE and Liquid Exchanger (LE). (iv) Exclusion chromatography: This is based fundamentally upon exploitation of the difference in size or molecular geometry of the components. In gel permeation, small constituents are retained in inter shell spaces or pores while large size components emerge first. Examples include gel permeation (GP), ion exclusion and molecular sieve chromatography. (v) Electro Chromatography: Process under this category is often classified as electrophoretic techniques. In these separations, the difference in mobility of dissimilar ions when an external potential is applied. Instances comprise zone electrophoresis, boundary layer electrophoresis, curtain chromatography and capillary electrophoresis of all the chromatographic methods accessible, GC and HPLC are utilized more often for routine analysis of environmental examples. Through GC, it is probable to divide an extremely compound mixture enclosing up to 200 or more related compounds, using either partition or adsorption, through extremely tiny example sizes. 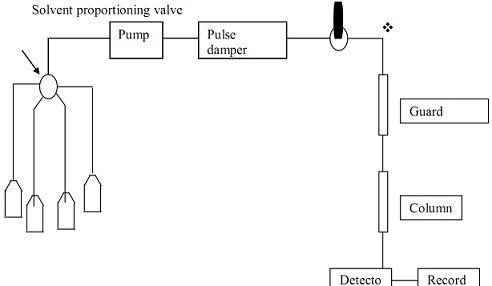 It is similar to liquid-liquid chromatography except that the mobile liquid phase is swapped via a moving gas phase. The stationary phase might be solid or liquid. The example for GC analysis must be able to survive in the gas phase, so it might be applied to volatile substances only. Therefore, non-polar substances are easier to handle than polar substances; ionic materials can't pass through a GC. For polar substances as alcohols, amines, free fatty acids and phenols, derivatisation may be needed. The carrier gas, from a high-pressure cylinder is helium, nitrogen, hydrogen or argon. The option depends on issues such as availability, purity, expenditure and type of detector. Until lately, GC analysis was handled using packed columns in that the stationary phase is a liquid, which has been coated on an inert granular solid termed the column packing (restrained in borosilicate glass tubing). More recently, though, the borosilicate glass tubing packed columns are being replaced by fused silica or quartz capillary columns. The column is installed in an oven throughout the inlet joined to a heated injector block and the outlet attached to a detector. Precise and stable temperature control of the injector block, oven and detector is sustained. Stationary phase material and concentration, column length and diameter, oven temperature, carrier gas runs and detector type are the manage variables. Instance solution is usually initiated using a micro syringe through hypodermic pointer included through a self-sealing silicone rubber septum. The instance is smoothing imparted into a heated metal block at the head of the column. Modes of placing examples onto the column can be via split injection or split less injection. Manipulation of the syringe is an art expanded through practice, and the aim is to initiate the example in a reproducible technique. The temperature of the example port should be these that the liquid is rapidly vaporized with no either decomposing or fractionating the sample. A helpful rule of the thumb is to place the example port temperature approximately to the boiling point of the least volatile component. For hugest competence, the smallest possible sample size (1-10 ∝ L) consistent through detector sensitivity should be utilized. In GC model analysis, interferences might take place from contamination of samples, chromatograph improper purposing and countermeasures that can manifest notify of septum bleed, column bleed and ghost peaks demonstration. The function of a GC detector is to sense and compute the tiny amounts of the divided components present in the carrier gas leaving the column. The choice of a detector will depend on factors such as the concentration level to be computed, the nature of the divided components and the properties of the detector for instance elevated sensitivity, good linearity, stability and response. a) Hot-wire director (HWD): This is as well known as the thermal conductivity detector (TCD) or katherometer. It is the oldest GC detector. Due to its inherently huge volume, low sensitivity and contamination problems, it was extended dismissed as inappropriate for capillary systems. It is ordinary in its applications. c) Flame ionization detector (FID): This more or less universal detector is extensively utilized as of its high sensitivity to organic carbon-containing compounds. It is perhaps the most broadly employed detector for GC. Its benefits include: (i) it responds to almost all organic compounds through elevated level of resolution; (ii) it is resistant to ordinary carrier gas impurities these as resistant to common carrier gas impurities these as water and carbon; (iii) it has a huge linear responds range and excellent baseline stability; (iv) It is moderately insensitive to tiny column flow-rate fluctuations during temperature programming; (v) it is extremely reliable, rugged and easy to utilize; and (vi) it has low detector dead- volume consequences and fast response. Its 2 main limitations are: (i) it provides little or no response to non-combustible gases and all nobles gases; and (ii) it is a destructive detector that transforms both the physical and chemical properties of examples analyzed irreversibly. d) Photo ionization detector (PID): Photo ionization happens whenever a molecular species dissociates into a parent ion and an electron upon interaction through UV light. The PID detects organic and several inorganic species in the effluent of a gas chromatograph through detection limit as low as the pictogram range. The PID has an elevated sensitivity, low noise and an excellent linearity. It is non-destructive and can be utilized in series through a 2nd detector for more selective detection. PID can be activated as a universal or selective detector via purely manipulating the photon energy of the ionization source. e) Mass spectrometer (MS): Mass spectrometers can serve as detectors when coupled to a GC. The MS combines the ability to detect a wide variety of compounds with the capability of deducing compound structures from fragmentation patterns or mass spectra. The computer (for recording) encloses and can search a library of known mass spectra to recognize tentatively unknown compounds are utilized for verification after tentative classifications are made. f) Fourier Transform Infrared Spectrometers (FT-IR): As the MS, FT-IR is as well an independent instrument that can be coupled to a GC to serve as a detector. Although GC is extensively utilized, it is bounded to samples that are thermally stable and simply volatilized. Non-volatile samples, such as peptides and carbohydrates, can be analysed by GC, but only after they have been made more volatile via an appropriate chemical derivatisation. For this reason, the diverse methods comprised inside the general scope of liquid chromatography are among the most usually utilized separation techniques. In HPLC, a liquid instance, or a solid example dissolved in an appropriate solvent, is carried throughout a chromatographic column via a liquid mobile phase. Division is computed through solute/stationary-phase interactions, including liquid-solid adsorption, liquid-liquid partitioning, ion swap and size exclusion, and via solute/mobile-phase interactions. In each case, though, the basic instrumentation is basically the similar. An HPLC typically included 2 columns: the guard column and an analytical column. The guard column is an inexpensive column situated before the analytical column (a more expensive column), protecting it from contamination and harm, whilst the analytical column does the division. In HPLC, the stationary phase is a liquid film coated on a packing substance consisting of 3-10 ∝ m porous silica elements. The stationary phase may be partially soluble in the mobile phase, causing it to "bleed" from the column over time. To prevent this loss of stationary, it is covalently bonded to the silica particles via reacting the silica particles with an organochlorosilane (Si(CH3)2 RCl). The elution order of solutes in HPLC is governed via polarity; the least polar solute spends less time in the polar stationary phase and is the 1st solute to elute from the column. Retention times in a normal-phase separation are controlled via selecting the mobile phase, through a less polar mobile phase leading to longer retention times. In a reverse-phase separation, though, the order of elution is reversed. As by GC, numerous detectors have been expanded for utilize in checking HPLC separations. To date, the most HPLC detectors aren't exclusive to the technique, but are either stand-alone instruments or modified versions of the similar. The most popular ones are spectroscopic detectors (for example UV/visible absorption and fluorescence) and electrochemical detectors (these as amperometry, voltametry, coulometry and conductivity based detectors). A refractive index detector is sometimes employed as a universal detector.